Bus from Singapore to Port Dickson is one of the favourite routes for locals, visitors and tourists because of Port Dickson distinctive and relaxing beach resort. Port Dickson’s location is adjacent to the beach and a bit off from the main city Seremban and main road north south highway, bus is the only convenient transport to go from Singapore to Port Dickson. Golden Coach and KKKL are only bus operator providing regular bus from Singapore to Port Dickson. Both supply only 1 daily morning departure in Singapore. The bus fare for bus from Singapore to Port Dickson is at SGD35.00. Usually passenger will buy return service at SGD70 because of limited bus service. Please note that bus fare will usually go up to as high as SGD50 per way during the festive season and long weekend. The duration of the journey is about 5 hours depending on traffic condition. Usually 1 washroom break will be provided during the journey. Golden Coach bus service boarding point is located at Concorde Shopping Centre and City Plaza, while KKKL departure point is located at Textile Center. They provide a few convenient hotel drop-off points in Port Dickson, including Grand Lexis Hotel, Avillion Port Dickson Hotel, and recently opened high end villa Lexis Hibiscus Port Dickson Hotel. Besides hotel drop-off, the same coach will also drop off passenger at Lukut small town in Port Dickson. Interested to go Port Dickson for short relaxing vacation? 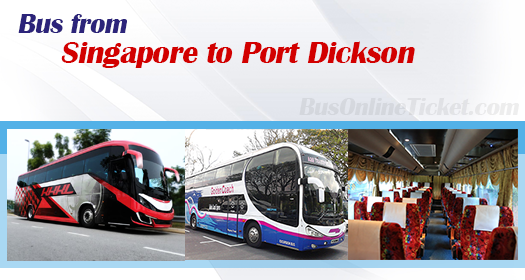 Please visit BusOnlineTicket.com to make your booking online to get instant confirmation for your bus ticket to Port Dickson. BusOnlineTicket.com, the largest bus ticketing portal in Malaysia and Singapore, has almost all the choices available in the market for you to choose from, and thus provide the convenience to customer to book ticket online instead of purposely going to counter, just to buy a bus ticket to Port Dickson.